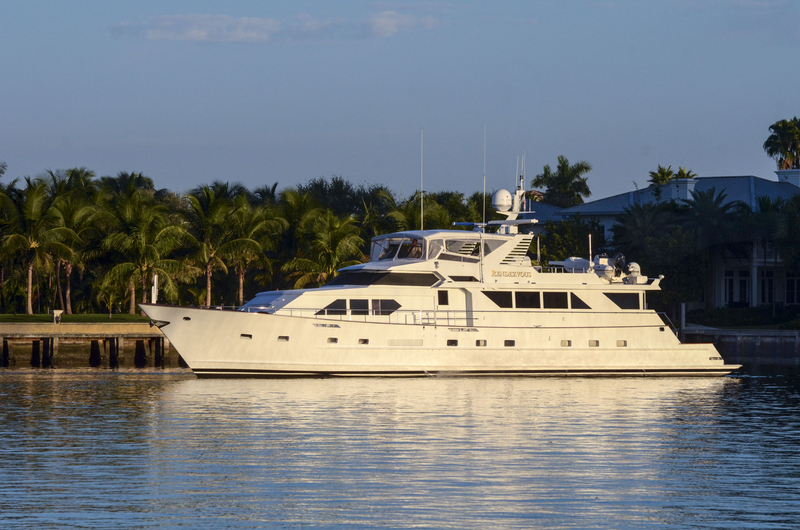 This 120′ Broward, SIGRUN, is one of the finest well equipped raised pilothouse motoryachts ever built by Broward. Her rare on-deck master and 23′ wide beam is amongst various custom upgrades which make this vessel very unique and in a class by herself. Her green hull was painted in October 2011 and her oyster awlgrip house was painted in Oct. 2010 reflecting her impeccable maintenance program. Offered for the first time for sale by her commissioning owners, SIGRUN boasts of improvements and design by a very experienced yachtsman and the original build Captain. She accommodates up to ten guest in a five stateroom layout with two VIP staterooms below and an on deck master stateroom. Powered by reliable 3412 Caterpillar engines, SIGRUN has an exceptional range holding 13,000 US gallons of fuel while maintaining a cruising speed of 17 knots. The Northern Light 55KW generators are enclosed in sound shields and are capable of independently powering the entire vessel very quietly. This vessel is truly “TURN KEY ” and is a must see! Please visit this link: http://vrtour.virtualsinc.com/company/yachts/426 and take an intimate virtual tour of SIGRUN which illustrates her elegant interior and deck space. 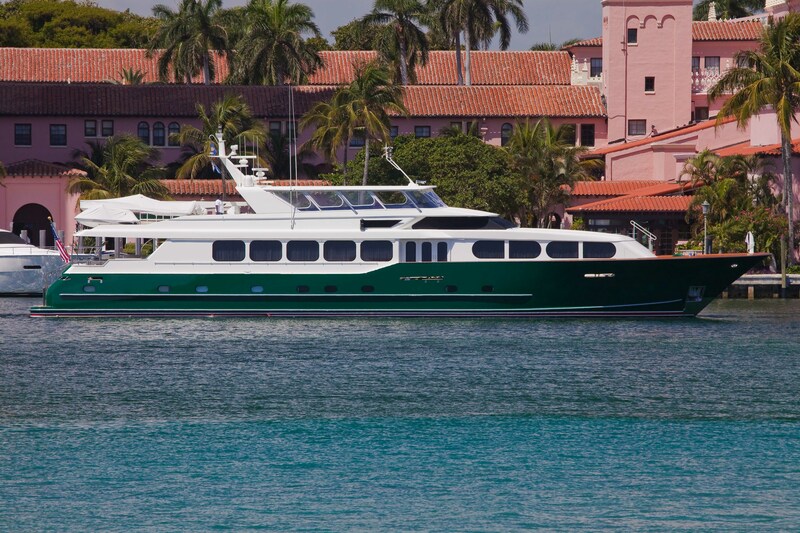 SIGRUN is located in Boca Raton, FL., and available for private inspection. Please contact Raymond Young at (954)658-2693 for further information. RENDEZVOUS is a classic 100′ Broward Cockpit MY featuring Broward’s most desirable layout used during this era. She features three staterooms for the owner’s party with a generously sized full beam master stateroom with his and her baths. The port guest stateroom features a queen berth while the starboard guest includes two twin berths and a pullman berth. Both guest staterooms have en-suite heads with stall showers. The crew quarters are located forward in the bow and include three separate crew staterooms and a crew head. The large main salon features a comfortable seating area aft and formal dining area forward, with new carpet and stone counter tops. The enclosed aft deck is an extension of the main salon and features a full service bar to port and additional seating to starboard & new marble flooring. Forward on the main deck is the spacious “country kitchen” style galley with a large dinette, new stone counter tops and new carpet. Access to the crew quarters is via a stairwell forward in the galley. Access to the raised pilothouse is from either port or starboard forward of the main salon dining area. The flybridge is accessed via stairs up from the pilothouse. The flybridge provides an excellent area for outdoor entertaining with a walk-up bar, gas grill, and abundant seating and lounging areas which are both covered and uncovered. The boat deck houses a wave runner & Marquipt davit. The cockpit is accessed via port and starboard stairs from the enclosed aft deck and is another excellent area to enjoy the outdoors. A large swim platform with swim ladder makes it easy to board tenders or waverunners for swimming, fishing or other water activities. The vessel was totally refit in 2006 and 2007 with all worked managed and supervised by a highly experienced Broward yacht captain. The refit was inclusive of many of the ships engine room systems and equipment including both main engines two new generators and upgraded stabilizers. The refit also included interior updates and upgrades to include all soft goods, carpeting and fabrics. RJC Yachts Sales & Charter – 2005 100′ Hatteras Motoryacht, TRIPLE ATTRACTION – Owner Wants SOLD! 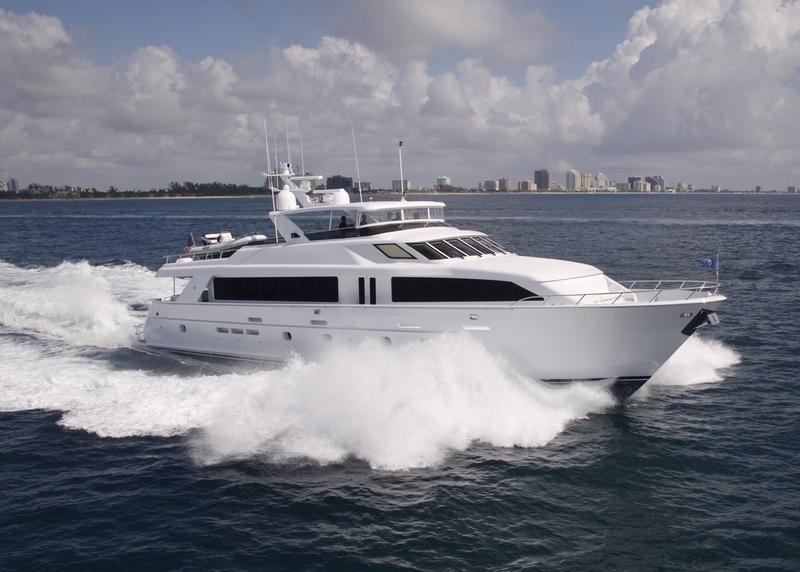 Newest 100′ Hatteras MY available with full recent hull & engine surveys available upon request! Please contact the RJC Yachts Sales office (954)525-7484 or Central Agent, Bob Cury (954)980-3451 for additional information or to schedule an inspection.